CALL YOUR PRINTER NOW! Get on their radar asap. Let them know you have holiday work coming their way – even if you aren’t sure what it is – so your delivery and drop dates can be met. You may not be mailing holiday cards in December, but everyone else is. Don’t get caught in that traffic jam or make your service providers rush because you didn’t plan. That is when mistakes happen, and the holidays are the worst time to ask for favors because everyone is! ORGANIZE YOUR TEAM AND CLIENTS! I am always speaking from my ad agency experience, however this should apply to any internal production scheduling – LIE! Give yourself plenty of buffer time for file delivery; you will need all of it and more. Avoid needing approvals from the major players anywhere near a holiday – like from now until after New Year’s. Keep in constant contact with your vendors and if you can help them by bumping your work to allow them to help someone else, be generous… the holidays are about giving, and you can remind your printer the same when you need to bump someone a few days later! DON’T PANIC! Yeah I know I said up there, but it’s worth mentioning again and giving some more detail. The holidays are a crazy time for marketing, and unexpected things will come up – count on it. The only thing you can do is be prepared for anything, and work closely with your service providers for solutions before promising anything. My final words of advice for the holidays: “Let me check on that and I’ll get right back to you” is the only thing you should say from now until 2016 regarding the “is this possible?” question. You will get it done because we know there isn’t another option, but during the next few months it takes a village of elves and then some to pull off the holiday miracles. Next month: Does The Press Matter? — and p.s. SPARKS WILL FLY over this topic!!! 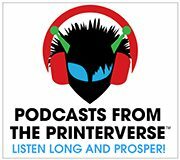 I laughed when I saw Mathew’s comment “Most printing companies like to take a break. Some even shut for a whole week”. Really? In this day and age companies can afford to shut down just because it’s the holidays? Not here in New York! And as much as I appreciate your comment to plan ahead, again, REALLY? We are all at mercy of the end client and rarely have I seen them be concerned with anything other than waiting till the very last minute. Of course from our perspective here at Influence Graphics, that the value of digital printing. Everything is a rush and due yesterday but we get it done. That’s just the business we’re in. I know your comments were probably directed more at offset printing and yes there is more planning required for them. But then again that’s why digital printing is growing compared to offset.